At Creity Hall, we make it our business to make you as comfortable as possible, whether you are simply overnighting with us on your way to another destination or spending a few days in Doune as a base for sightseeing around Stirlingshire and the Trossachs. In fact, in our experience, many of our guests book for one night and end up staying two or three. In the main house, we offer all our guests comfortable bedrooms with ensuite bathrooms. Freshly brewed tea and coffee is available with biscuits or shortbread on request. Don't take our word for it. Read what they are saying about us on Trip Advisor. Dogs are welcome in the Chalet. We charge a one off fee of £20 per dog per stay. For the comfort of other residents we do not allow pets in the guest house. We are delighted to be amongst the winners in the Booking.com 2016 Awards. 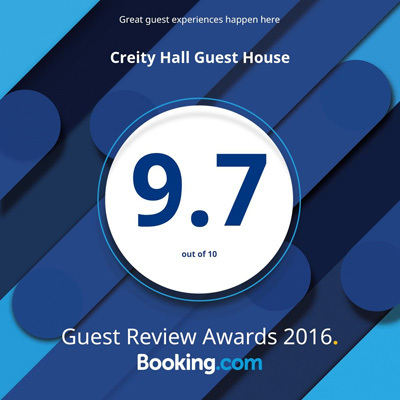 Our guests scored Creity Hall an average of 9.7 out of 10 in their reviews. A big thank you to them. We will keep striving for 10 out 10 for all our reviews. Doune is situated in Central Scotland, about 8 miles from Stirling and 8 miles from Callander and the Trossachs. The village of Doune is a 2 minute drive or 12 minute walk from the Hall. Further afield are Edinburgh – 45 miles (1 hour drive or by train) and Glasgow – 45 minutes by car or 35 by train.